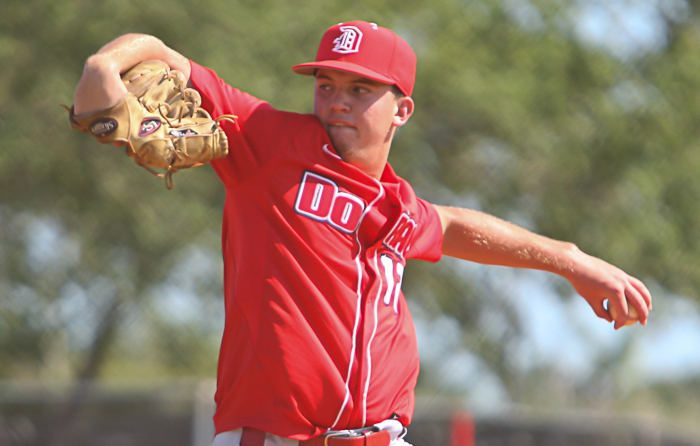 Doral starter Adrian Figueroa went four innings to earn the win over TERRA on Thursday. 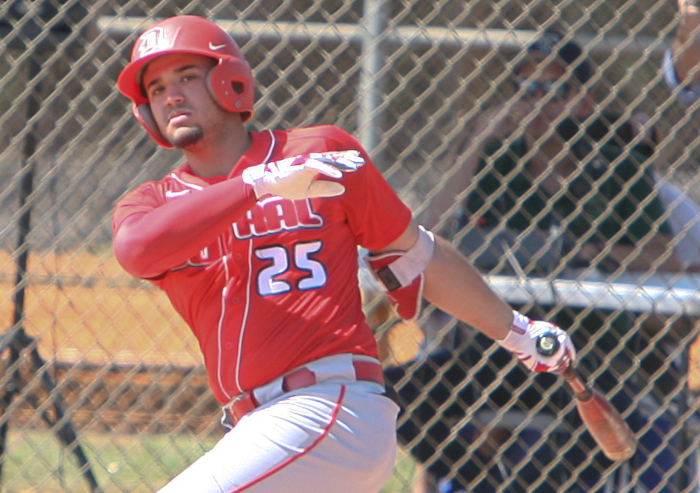 Doral Academy brought its bats to Kendall Indian Hammocks Park on Thursday afternoon, banged out 12 hits including a home run, and remained atop the 7A-16 standings with a methodical 8-1 win over TERRA. Winning pitcher Adria Figueroa got more than enough production. The 6-6, 220-pound lefty went four innings, allowing just two hits. “Before the game we talked about pounding the strike zone and we’re going to have success; put the ball in play and let the defense work,” said Figueroa. The win lifts the Firebirds to 4-0 in district play and 13-3 for the season, easing the pain of losing three of four games on a recent road trip to the prestigious Dessert Classic in Las Vegas, NV. “We’ve played extremely well,” Doral manager Ralph Suarez said. “We had a little hiccup over there on the West Coast. But for the most part our pitching has been very good all year long. Hitting is starting to get a little better. And we’ve still got a ways to go. Ranked No. 3 in the Miami-Dade Power Rankings, Doral faces another huge test tomorrow against IMG Academy. The Firebirds took care of business on Thursday, sparked by a three-run homer from Abner Benitez in the second inning. 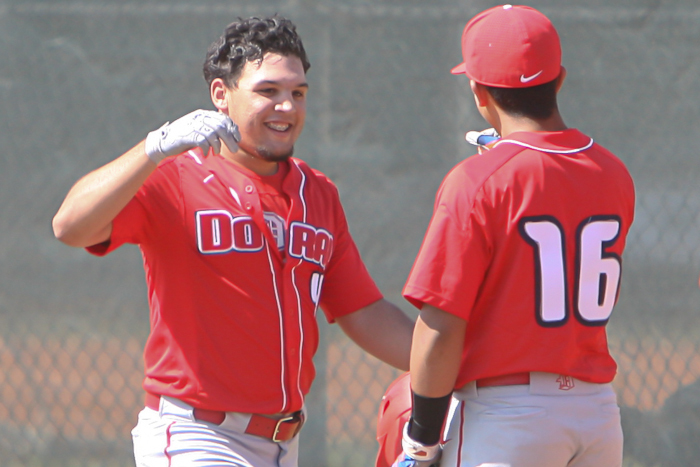 Doral’s Abner Benitez is congratulated after his three-run homer in the second inning. Benitez drove in four runs and scored three in the Firebirds’ 8-1 win over TERRA on Thursday. Though unexpected to see three consecutive sliders, Benitez remained focused. “I didn’t think he was going to throw anything in the zone with two strikes, but I was ready to hit the whole time,” said Benitz, who walked in both the fourth and sixth innings, scoring each time, before closing the scoring with a run-scoring single in the seventh to pace a team he said he couldn’t be happier with. Xavier Moronta drove in three runs and Dominic Pitelli scored twice. Gabriel Gutierrez added one RBI while Nicolas Pitelli had two hits and scored a run. Matthew Corpas and Figueroa delivered two hits apiece. The Firebirds produced up and down the lineup. 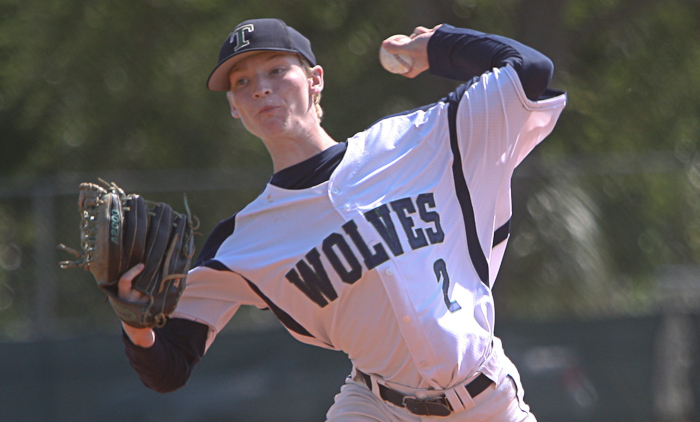 TERRA starting pitcher Matthew Mckeever delivers in the early innings of Thursday’s game. Wolves’ first baseman Angel Gutierrez accounted for his team’s lone run with his first home run of the season, a solo blast in the fourth inning. “I was on a two-strike approach,” said Gutierrez. “I got down two strikes and my mentality was not to hit a home run. It was just my mechanics to stay on top of the ball. He was throwing from up top, so I knew he was coming down. Figueroa said he left a change up high and Gutierrez took advantage of it. Doral’s Gabriel Gutierrez singled and drove in a run during the Firebirds’ 8-1 win over TERRA. Gutierrez said that he wasn’t sure the ball would get out of the park when he hit it. Ian Labrador had two of TERRA’s five hits, both singles. Ronny Medina finished up for Doral, working the final three innings, striking out four.